SW KyMBA was founded in 2010 by a group of mountain bikers who were tired of driving out of state to find quality trail to ride. Southwest Kentucky Mountain Bike Association is a 501c3 non-profit organization whose mission is to create, enhance and preserve great trail experiences in Kentucky. The 2019 Low Hollow Trail Fest to support SW KyMBA’s Trail endeavors is swiftly approaching and we want you to join us for some good times. Our Title Sponsor again this year is Graves Gilbert Clinic. We are currently working on our other Sponsors and hope to be announcing soon. With food, friends, trail runs, and mountain bike races, you don’t want to miss out on this year’s event. Registration & Check-in booth opens at 7am. We will kick off with the 5k Trail running race at 8:00 am. The first MTB event will begin at 10:00am. This is a fundraising event for the future trail building efforts for SW KyMBA, a 501C3 Non-Profit Org. See the schedule of events below for more details. You may enter an individual event or save money and register for the King/ Queen of the Trail competition which is the combined fastest time for all 3 main events (5k run, MTB A & MTB TT). Prizes will be awarded to Age group and overall winners in the 5k and in Overall competitions for the MTB A, B & TT races, respectfully. Event T-Shirts are included in with your registration on a first come first serve basis. Thus the first 225 shirts are provided while supplies last so register early to secure your Trail Fest T-Shirt. The MTB A race (Cat 1 & 2) will be 6 Laps. The MTB B race (Cat 3 ) will be 3 Laps. The Junior category will be be 2 Laps. Both events are Non sanctioned (no license required) but will follow RRCA & USA Cycling rules respectively. *Women’s & Jr. waves will start 3 minutes after the men’s wave, respectfully. Depending on rider turnout we may choose to race Jr waves separately. 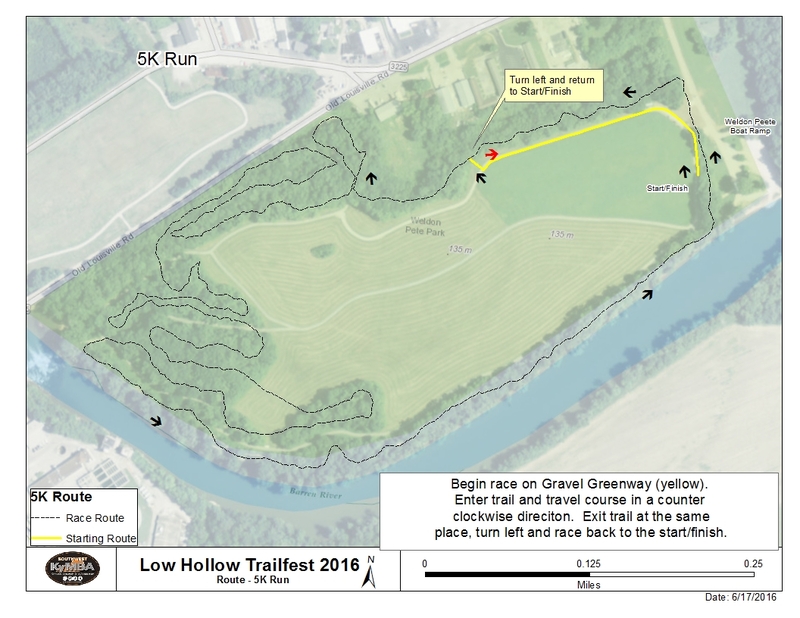 For participant safety and the sustainability of the trail the Low Hollow Trail Fest Race Director and staff will closely monitor weather and trail conditions leading up to the race. It is our goal to give the participant as much notice as possible should there be any need for an hourly delay or rescheduling to another day. Our two backup dates are Sunday 6/30/19 and Sat 7/13/19. Please be on the lookout for Trail Fest weather updates emailed to your address on file or from our postings on the Low Hollow Trail Fest & Southwest KyMBA Facebook pages. An electrical storm within the race course area within 30 mins of the start time should be considered potentially life threatening to runners and cyclists. A determination will be made at the time as to whether the race should be continued as scheduled, delayed until the storm has passed or postponed to a backup date. The Race Director will monitor the weather and make a decision if any action will be taken to modify the race. Possible changes include: Altering the start time or in the most extreme situations, postponement of the event to a backup date. Send runners/cyclists home if there is not adequate safe shelter for everyone to wait out the storm. Remember, trees are not safe shelter and lightning can strike up to 10 miles away. Visible lightning will cause the race to be postponed for a minimum of 30 minutes after the last strike is heard. Additional sightings or rumblings of thunder will continue to delay the race in 30-minute increments. Muddy trail conditions may warrant a postponement. In the event a participant cannot make their race due to a postponement the participant is still fully eligible to receive their race packet and T-Shirt. Note: Southwest KyMBA Volunteers have over 2500 hours of personal time invested in the Low Hollow Trail. Southwest KyMBA is seeking to add a dual slalom course, pump track and bike skills course alongside the Low Hollow Trail to achieve The Riverfront Bike Park. 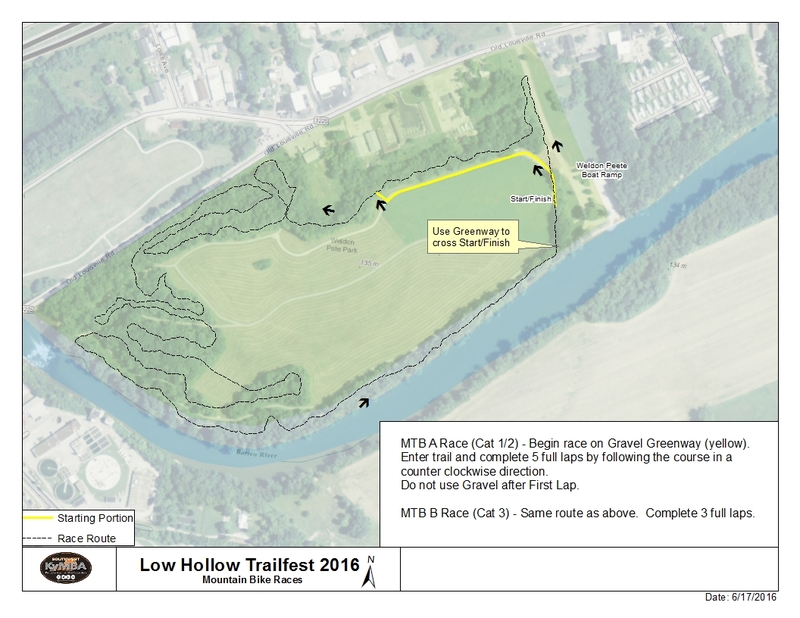 By participating in the Low Hollow Trail Fest you are helping us raise the necessary funds. Thank You!